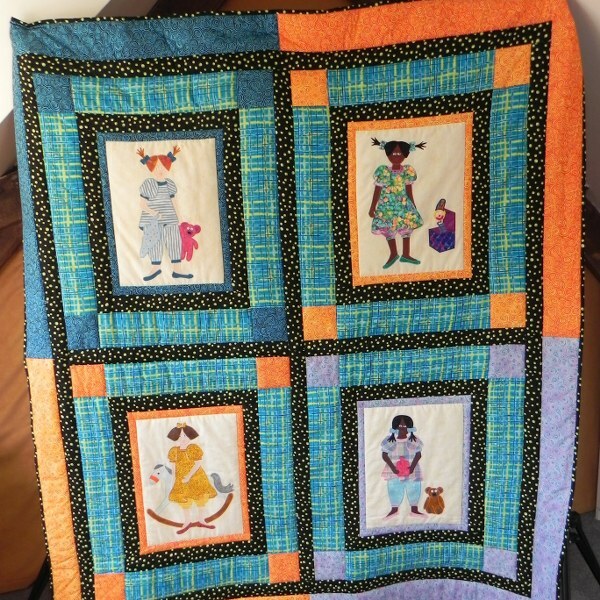 As I said in my last blog on my ‘little girls’ I progressed from doing one quilt with dark skinned girls and one with light skinned girls to one with both. It was obvious but it took me a lot of extra work to get to that point. 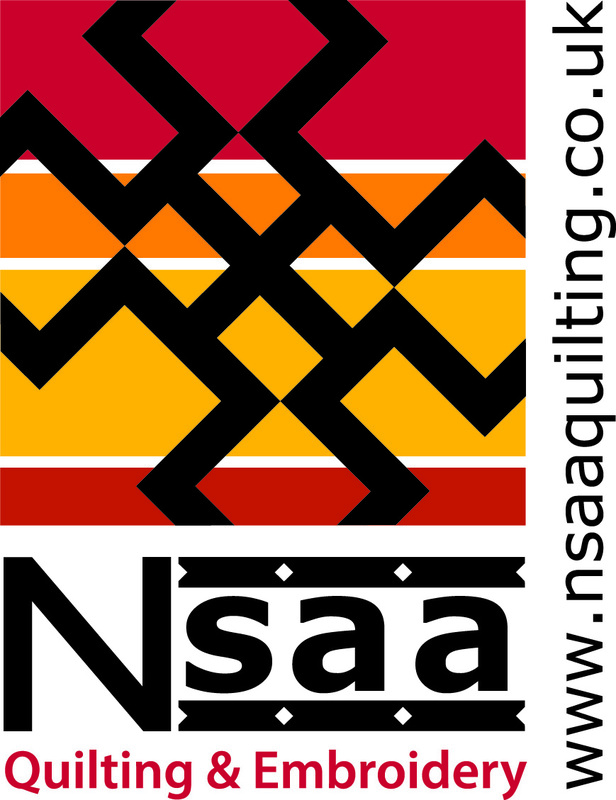 It’s not that I don’t like making quilts. 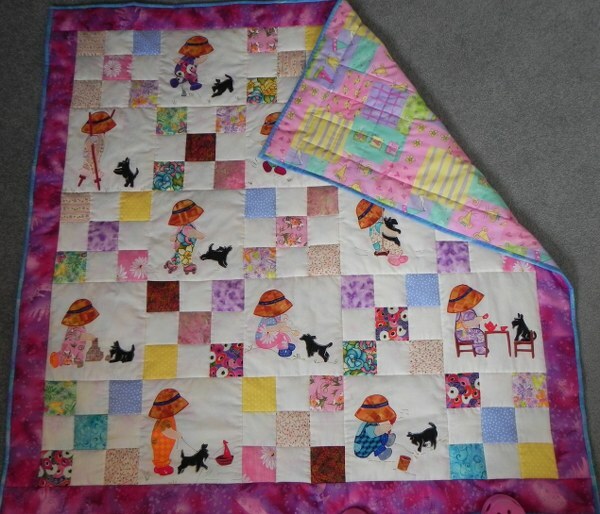 It must be patently obvious just from those on the blog – and they are only the tip of the iceberg, that either I enjoy making quilts or I am a serious masochist. 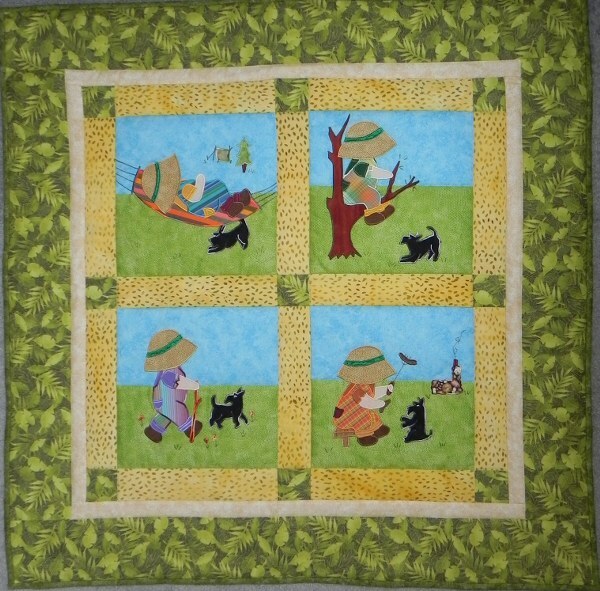 I love the applique and finishing the quilt top. 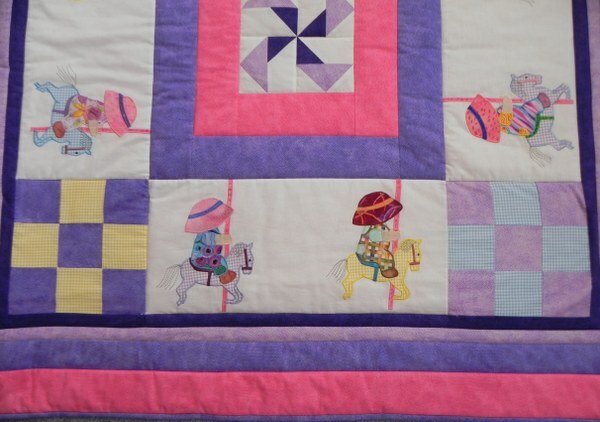 What I am not keen on is the actual quilting. I have never progressed beyond ‘stitch in the ditch’ except during a brief foray into the world of the ‘Little Gracie’ quilt frame. 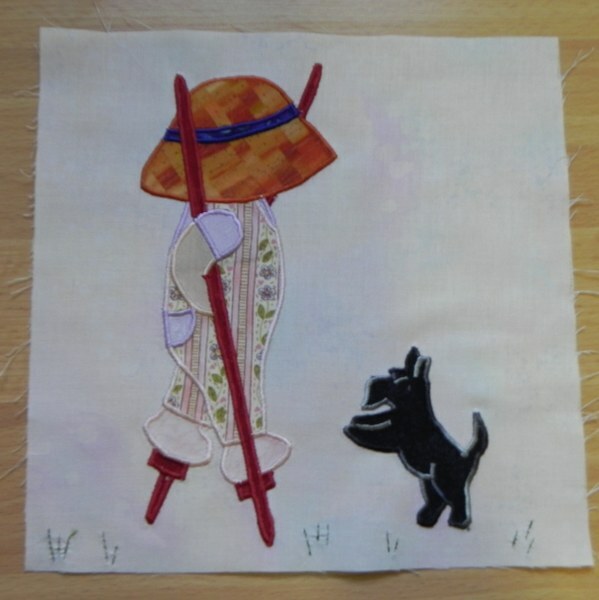 On that I never progresssed beyond the twiddly twirly pattern, as shown in my original Sunbonnet Blog, and got bored. I am however about to make a change there. I have booked onto a course on how to use the frame to its full potential. ( I think I was first in the queue) I am not sure that its potential is as high as I thought when I bought it but I am open to being converted. I think the fatal flaw is that unless you have a proper longarm machine as you progress the rolled quilt takes up too much of the throat space to allow a large area to work on. I am hoping for great things though and then maybe I will be able to be a bit more adventurous. 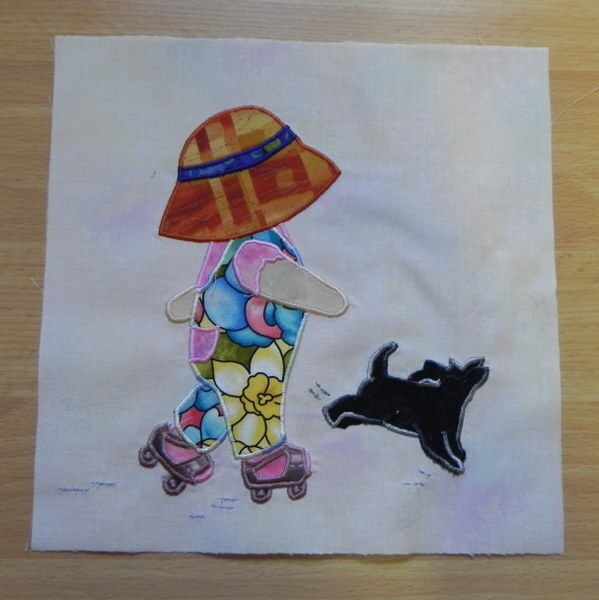 Having said that a lot of my quilts lend themselves to stitch in the ditch so that the appliques can be seen better. Anyway, I’ll keep you posted. 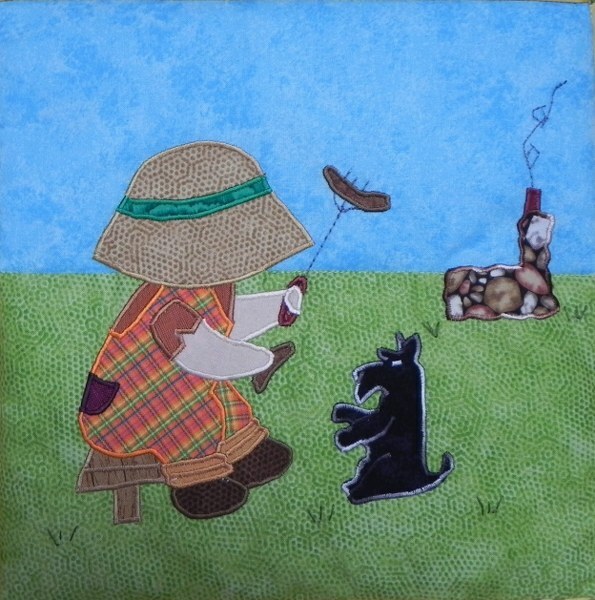 Maybe I can do as much for sales of Grace frames as I must have done for the Sunbonnet Sue books in my two modern interpretation of Sunbonnet Sue. (Here) and (here) in case you didn’t read them. Enough of the chat. You are here to meet Milly, Molly, Mandy and Mo. The first installment is called ”Toys at Bedtime’. 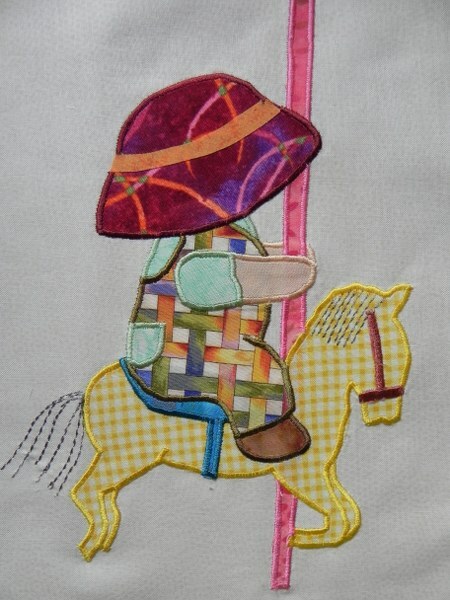 This is the rocking horse themed applique. 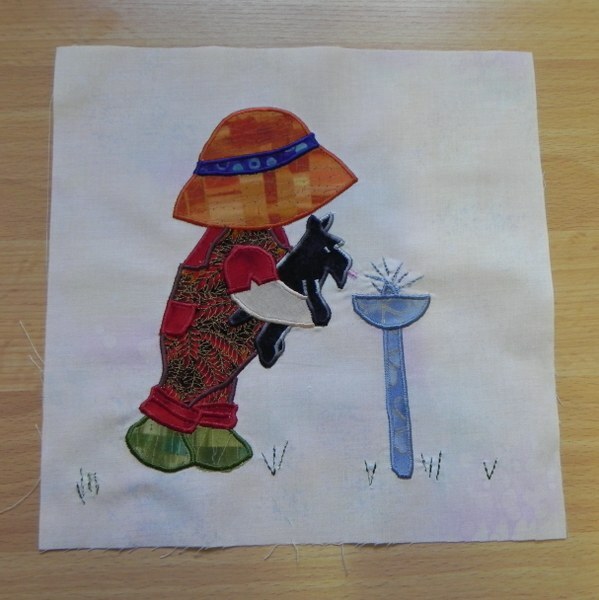 A rather nice touch would be to use yarn for the horses tail. This would only be possible if making a wall hanging as it is better not to have too many loose bits for little fingers. 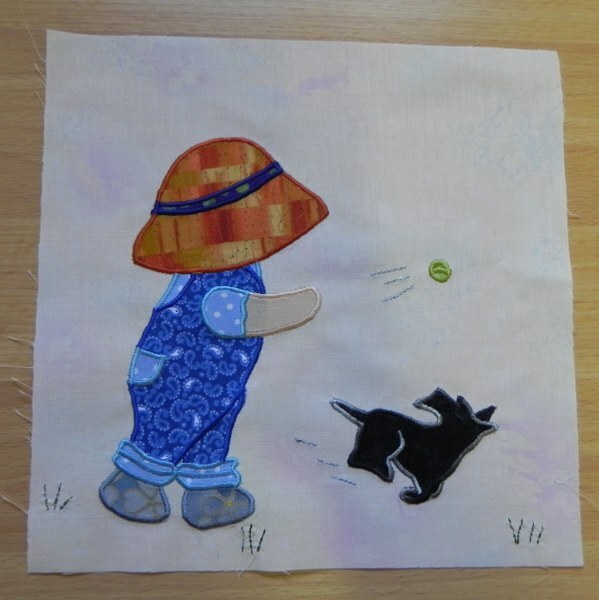 A wall hanging would be very easy using one applique finished to the full framing stage or maybe even two or three up to the spotted stage with a plaid border round the whole lot for a larger version. 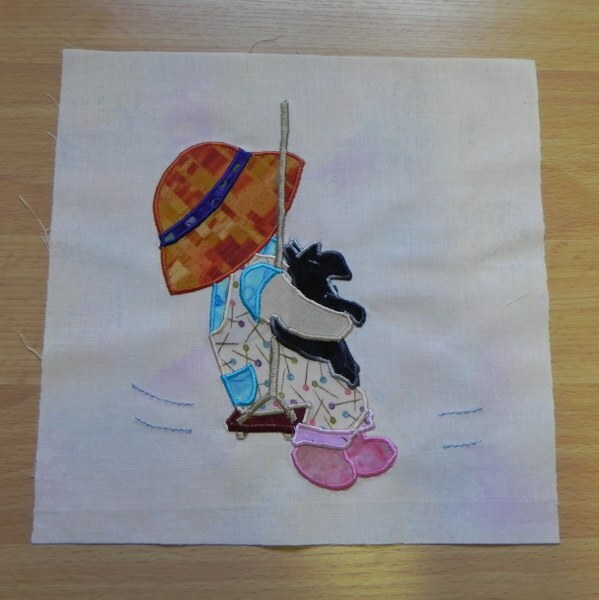 Fix a pocket on the back to take a piece of dowel and ‘hey presto’ one wall hanging. You could have a little group of them to match the quilt. Next I present the Jack-in-a-Box. 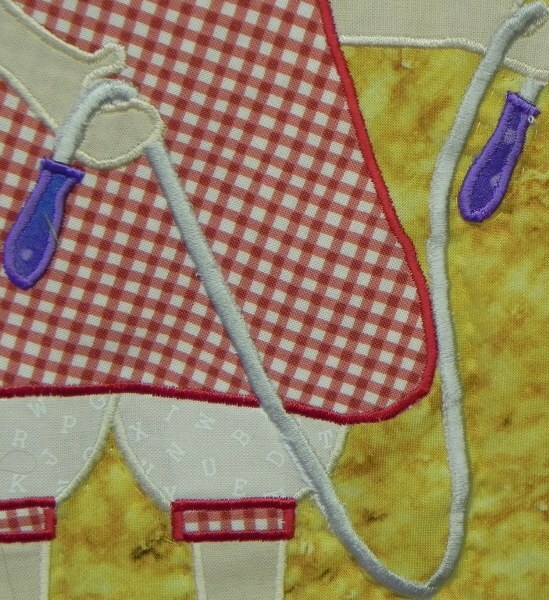 On this one yarn could be used to enhance the pigtails and give them texture. 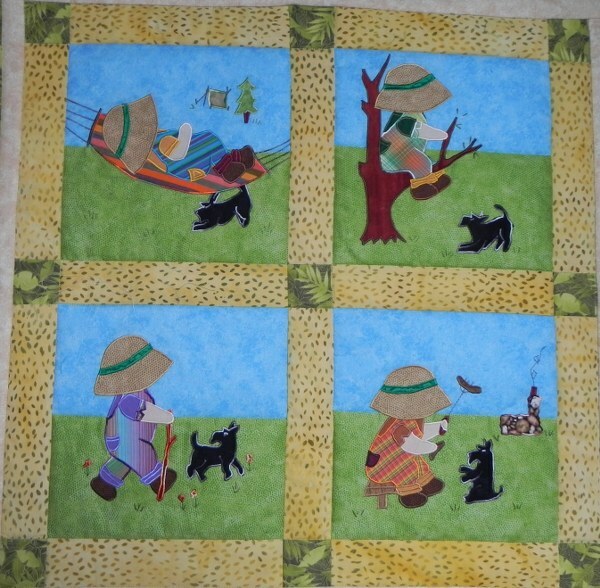 Again, only if on a wall hanging which is why I didn’t use it on this quilt. The idea with this one was that she would look a bit scared as the Jack jumped out of the box. It depends on interpretaion and to some she may look scared and to some just a bored teenager. Anyway, the point is that you can change the expression by changing the angle of eye, eyebrow, mouth and body. Also another chance to use some pretty material. The next two are ready for bed. the first one has a hot water bottle and pyjamas and a rather large bear. I used my stretch stitch to draw ridges on the hot water bottle to make it a bit more realistic. Again, yarn could give texture to the hair. When I was experimenting I found some black knobbly wool which looked particularly good. 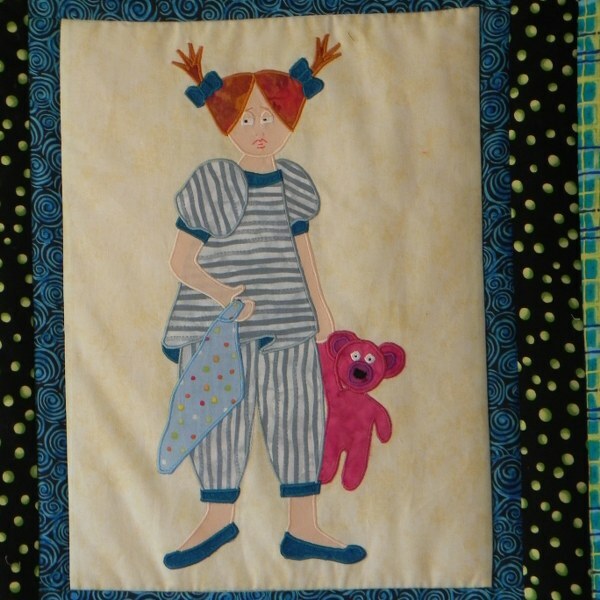 Last but not least is another pyjama clad little girl, this time with a teddy and blanket. That bear is really posing for his photo.The blanket round the hand is made up of two pieces to make it look as if it goes round the hand and is held. On this one I added eyelids to alter the expression. So much can be done just by altering the eyes. The direction of the pupils is especially effective as is adding eyelashes. 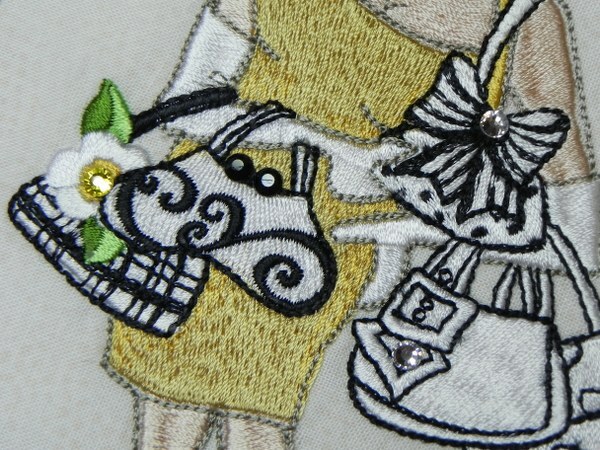 If you are really into embroidery which I am not, you could embroider different shaped mouths too. A Blue Blanket and a Pink Bear. 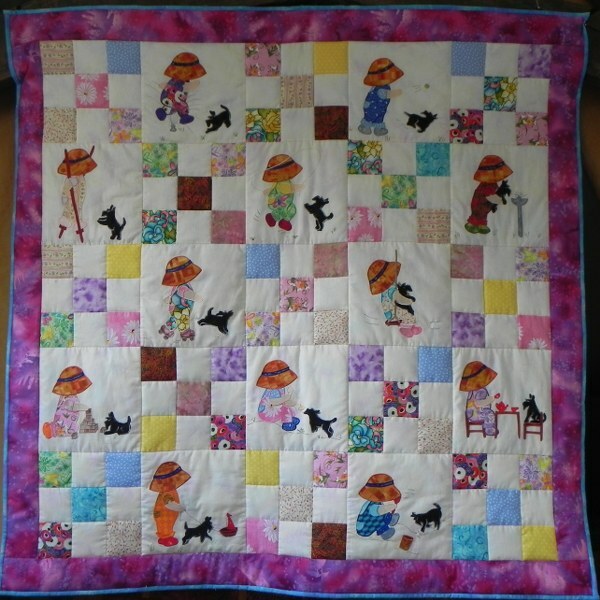 A picture of the full quilt. Hairstyles can be varied. As you can see just changing the placing of the pigtails changes the style quite a bit. You can now see what I mean about the wall hangings. If you were to make each picture sparately up to and including the plaid border, you would have very fetching wall hangings and all four would make a rather decorative set. they are quite an impressive size. When I saw this collection of fabric I had to have it. It goes together so well. That was Milly, Molly Mandy and Mo. I hope you enjoyed meeting them. 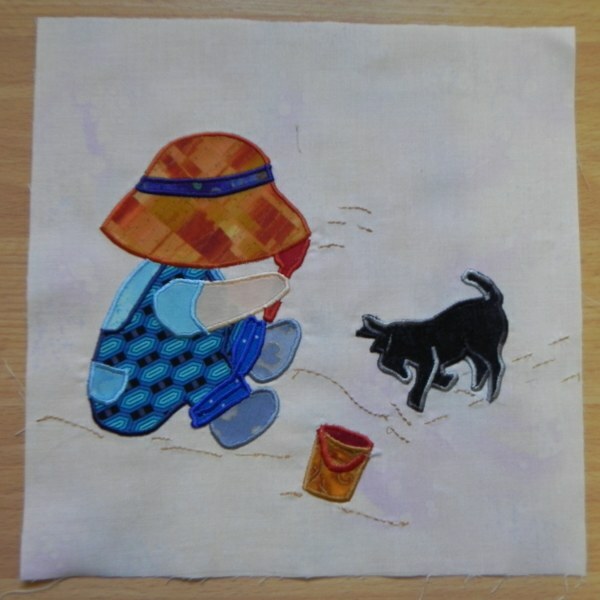 If you would like to have a go for yourself the pattern for the quilt can be bought from my website as can the fabrics featured and different colours of the same. 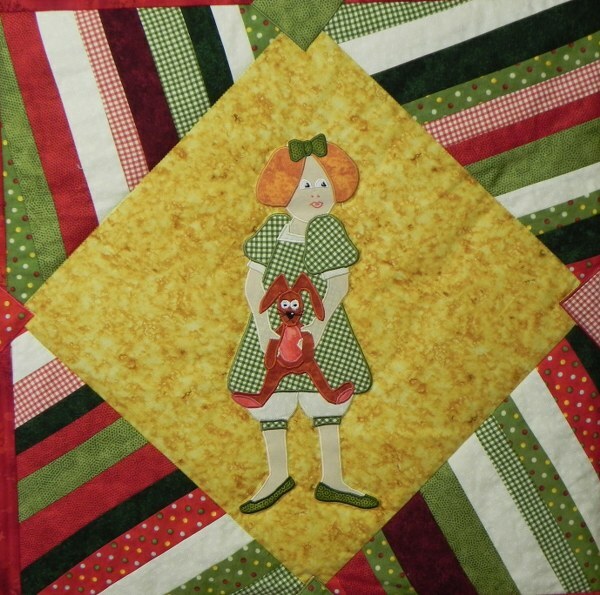 This is going to be one of those quilts I can’t even give away. It’s one of those that I know didn’t go right and every time I look at it I will remember. I have a rule that if I wouldn’t sell it (even if I wasn’t going to anyway) I can’t give it away so I guess this is what will be keeping my toes warm this winter. The Whole Quilt Finally finished. It was going beautifully. 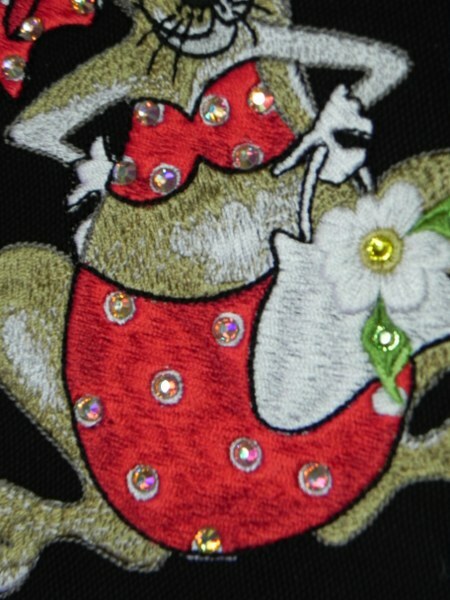 I had finished the applique and put it all together except for the outside pink border. I was even humming a little tune to myself. All was right with The World and then I looked at it again. I swear I heard the ‘Jaws’ music. It wasn’t that I hadn’t done it as intended, just that my intended layout was wrong. I had the horses upside down. Not a problem, you think. All I had to do was remove the panels and turn them round and away we go. That solution doesn’t take into account the use of the overlocker. I had to rip all the seams and then put them back together again. My nice neat straight seams were not as nice and neat as they had been. So what – it looks OK you might say. 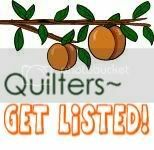 If you are a quilter you will understand. Never mind, all is not lost, I can still show you how it was done and enjoy warm toes in the Winter. 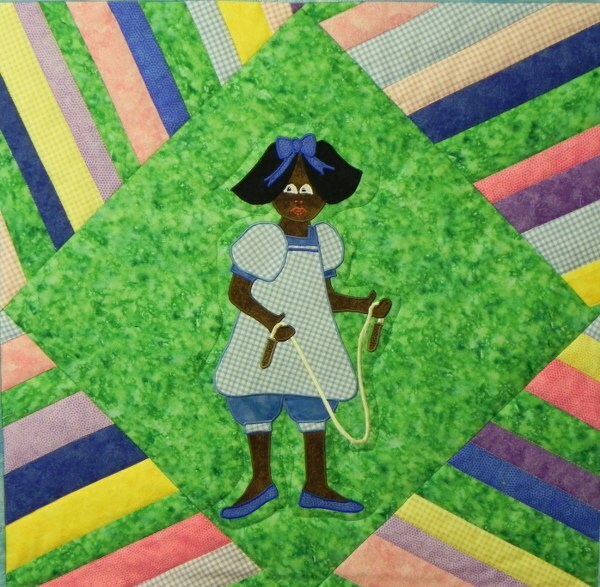 That is if the Quilt Police don’t read this and send the Black Maria round post- haste. 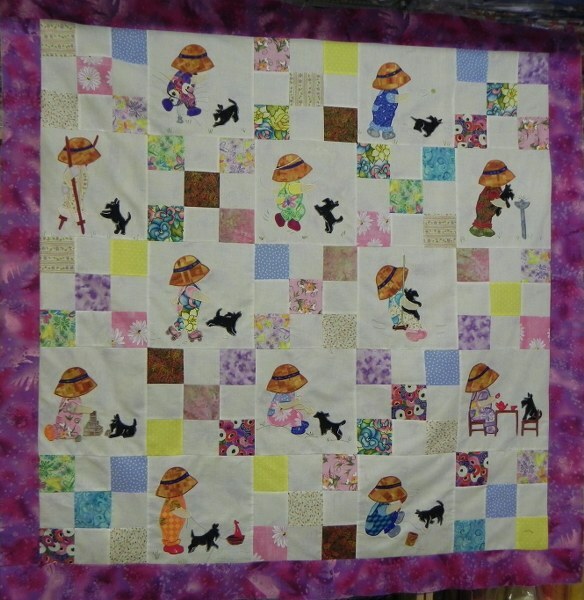 I started with another quilt from my favourite Sunbonnet Sue series although I am not sure I don’t need a change now. You can definitely have too much Sunbonnet Sue although I have enjoyed meeting her and I am sure we will renew our acquaintance. I liked the layout and even the colour scheme so decided to have a go. 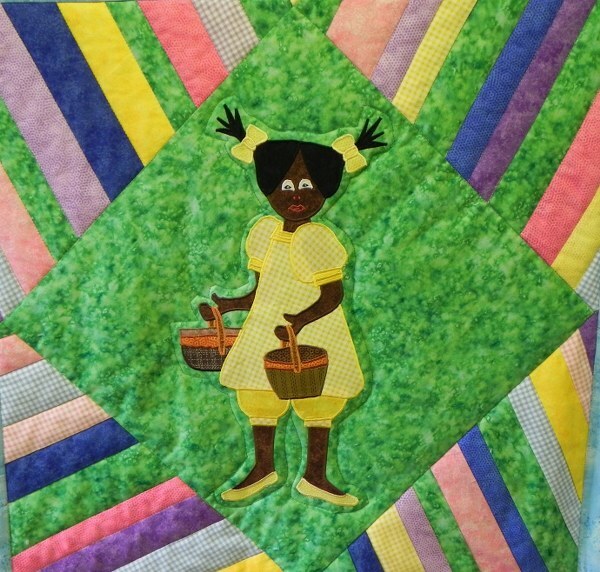 The original quilt pattern layout. 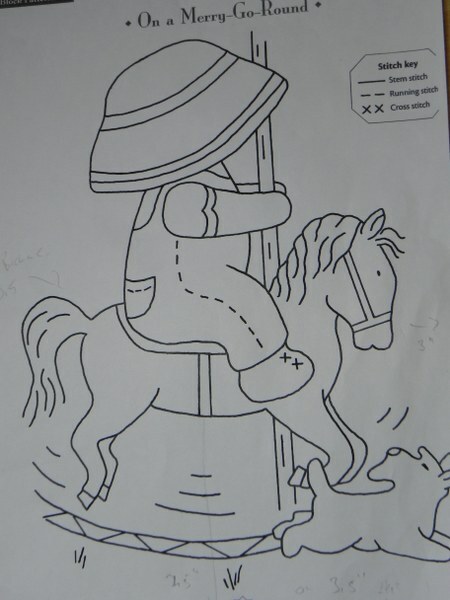 In the same book there is a template/ patterns for an applique of a Sunbonnet Sue on a carousel horse. I thought this would look good on the layout without being quite so repetitive, even though there would still be eight similar appliques. I decided that I could give the idea of a carousel top with the right pattern and then add borders to continue the theme. I was quite proud of the finished block as piecing isn’t my forté. My points have a habit of not pointing. They more sort of beckon. ( That should get me a few months sentence on fussy cutting from the QP). In fact I was so successful I might even have a go at a quilt with a few more in it. 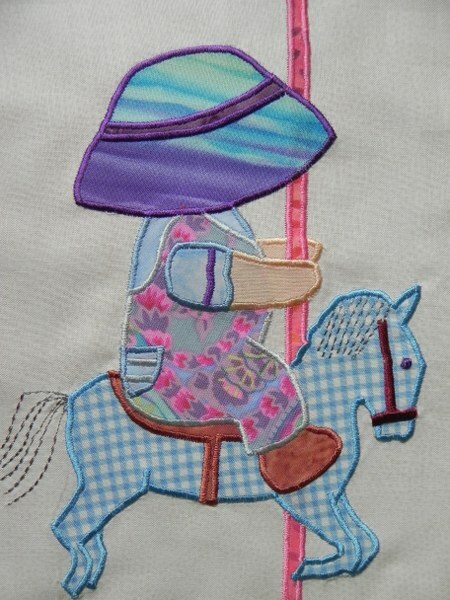 I then added the appliques, making sure I didn’t get the same colour adjacent either in horse or corner pieces. If this looks strange it is because it was photographed sideways. It was at the third border point that I realised my layout was badly wrong. I had the horses inwards, which would have looked very unimpressive. It only took me the rest of the day to remove and replace the panels. If they hadn’t been appliqued I would have started again. In fact, with hindsight I would just have extracted the panels and wasted the rest It would certainly have been quicker. You can be sure I checked and double checked everything after that. I think I will have a few days off sewing now and do something else. I have a couple basted and ready to go but as I don’t really like quilting I will go away and do something else till the mood takes me. 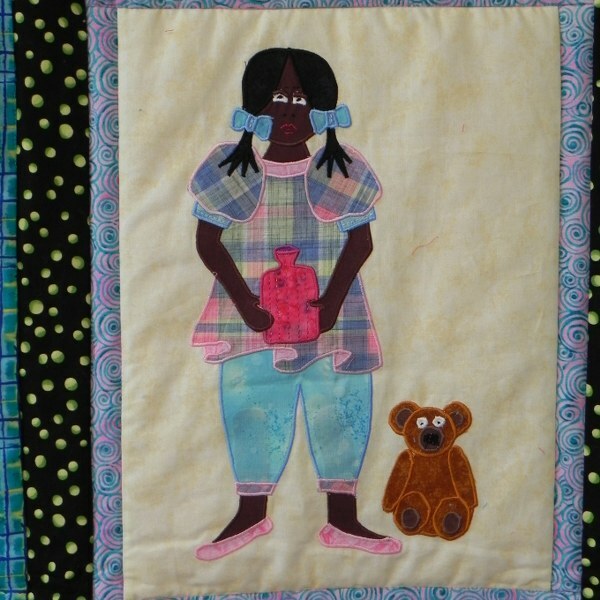 My ambition is to have all my quilts professionally quilted but the cost puts me off. Also I would think you need to know the quilter’s work quite well before entrusting hours of work to them. Maybe one day. I have a whole area in my dungeon, full of porcelain dolls that need photographing and listing so I think I will spend a few days doing that- if I can actually get in to where they are in the first place. Then I need to do certificates for them as the ones I did before are no longer impressive. Modern software has definitely outclassed the package I was using back in the dark ages. Mind you it’s only ever going to be as good as the user. At least it won’t be as disastrous as the quilt if my concentration slips. A little digression from my usual subject just to show you that I am not locked in the dungeon churning out quilts all the time. I am on occasions allowed a little light relief with other hobbies. I’m not what you would call a sparkly sort of a person. I don’t wear dangling diamonds in my ears or sequins on my ball gowns – in fact it’s a while since I even wore a ball gown with or without sequins. 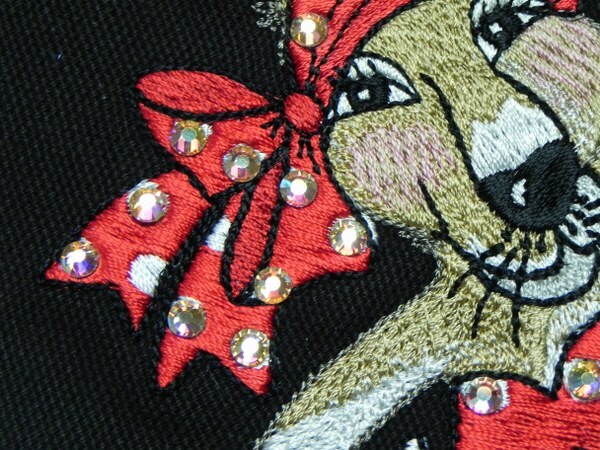 Unlike my Daughters I do not wear sparkly dance shoes or crystal encrusted dresses but give me an embroidery and I can’t resist pepping it up with a few shiny things. It all started last Christmas when I made the traditional Christmas gift. The tradition started four or five years ago when Daughter Number Two decided that as she now had a house and I always got stressed about the mess in mine over Christmas, that year we would have the celebrations at her place. 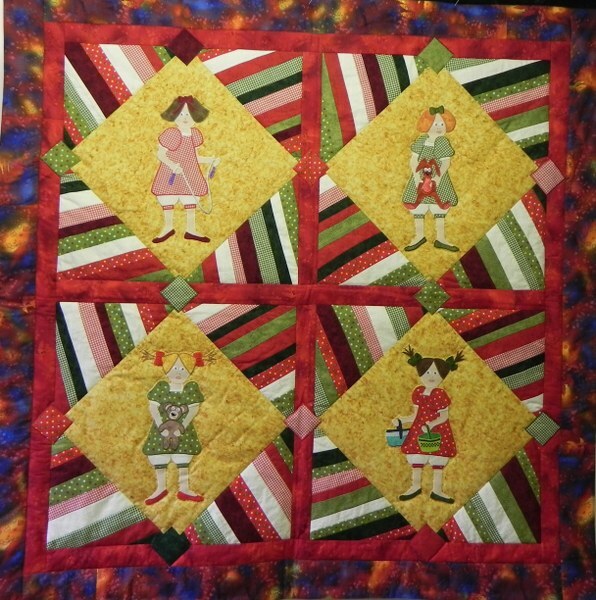 I decided that I would make something christmassy for whoever hosted and as she had it at her house three or four times she now has a selection of quilts and table toppers. Last year she was in Australia so we had it at Daughter Number One’s flat. It wasn’t easy as it is tiny and the tree was huge but we managed. Daughter Number One is definitely into sparkle. The copious amounts of tinsel pinned to the beams in our house every Christmas were mostly down to her. 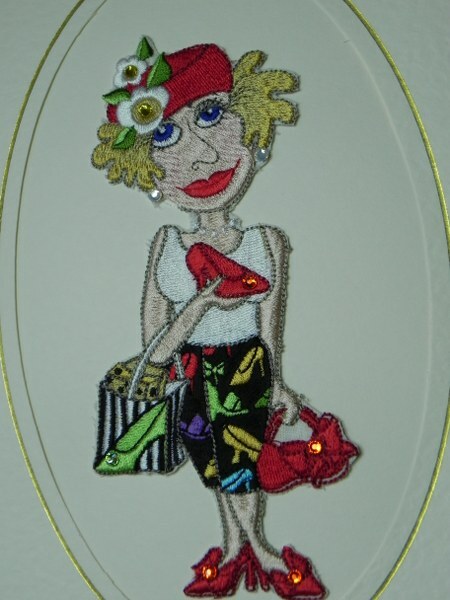 She is the one with the sparkly dance shoes and crystalled dresses so when I decided to do some embroidered pictures to add to her collection of decorations, I had to add crystals. I must admit they did look good in a christmas decoration sort of way. The trouble is that once I had seen the transformation a few shiny bits could do I had trouble stopping. 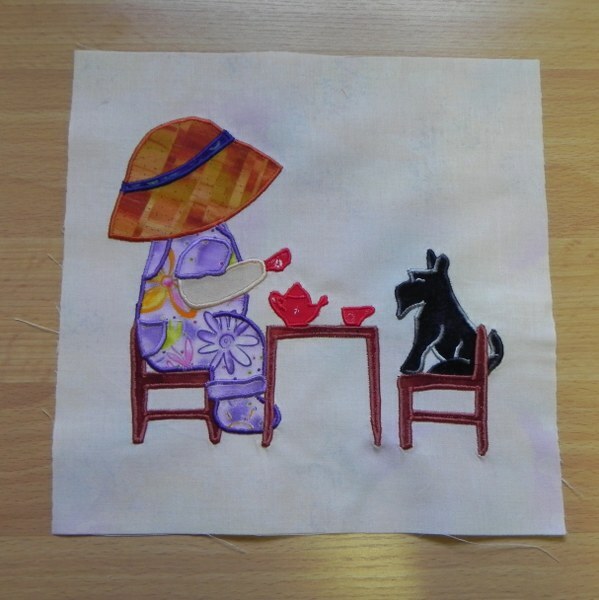 I had a few embroideries that I had done on fabric that was rather too thin and so I cut round them as appliques and decided to make cards from them. They looked fine as they were but I decided to try adding a few shiny buttons or flower centres and I couldn’t stop. 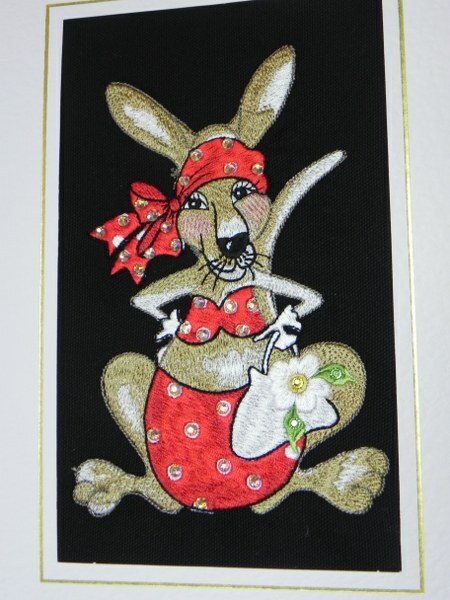 First of all Mrs Kangaroo who is actually a straightforward embroidery that didn’t need chopping up. She had lots of spots, what could I do? As you can see I went a bit overboard with the crystals on this one. Good job I’m not trying to sell them for profit. Bag ladies were never like this. As it is my turn for Christmas this year and I make the Christmas Tradition items I am deciding what to make myself and shall I wrap it up do you think. 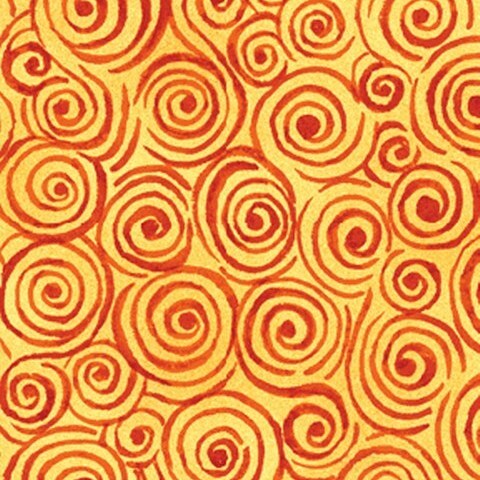 The way my brain is going if I wrap something up long enough before Christmas and bury it under the other presents. I can’t remember what it is. That could be a plan but only if I do it now. I have ordered a McKenna Ryan – Chrissie Down Under- with hopes of doing that for Christmas. I have never done one of her designs so it depends how I get on and I think it unlikely I would forget making that. 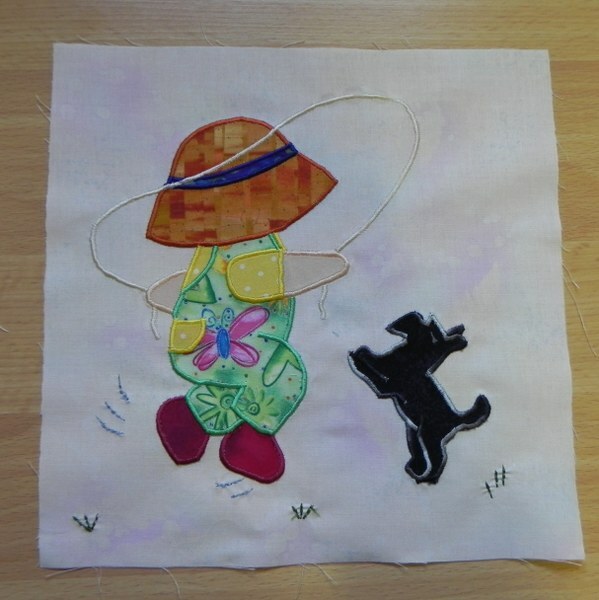 Perhaps a couple of embroideries might be a good idea. That way I can add some sparkle. After all it is for Christmas. 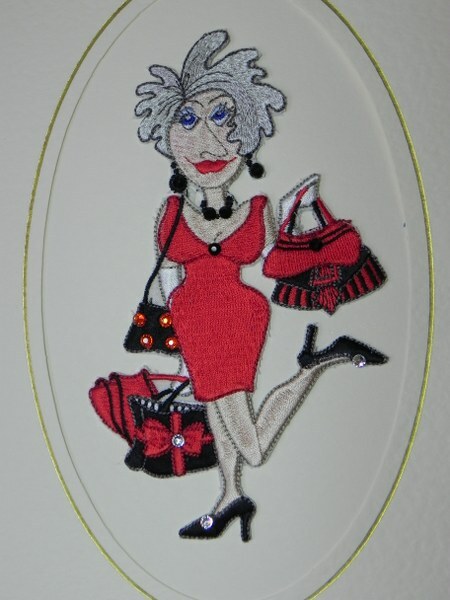 In case you are wondering the embroideries are from Loralie Designs. Ebony and Ivory and the ‘Lightbulb’ moment. If you have read many of my blogs, especially the earlier ones, you may have gathered that I design patterns. I have lived overseas on and off since the ’70’s and have always been fascinated by the children in the countries I have visited. 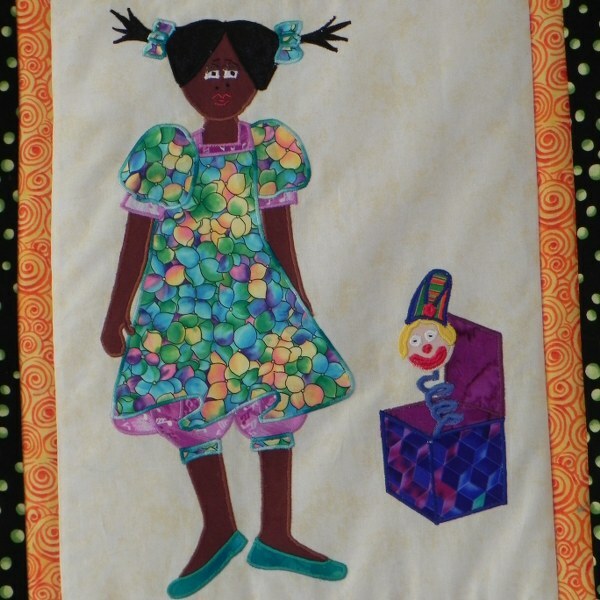 As a result, when I came to design a range of patterns featuring little girls, inevitably they had to be dark skinned. I had the greatest fun deciding what accessories to put in each picture. As I sketched my little girls I realised that I was being influenced by my surroundings. The dresses worn by them were subconsciously based on the ‘Merie blouse’ which is the outfit worn by women and girls in Papua New Guinea. It is of a simple design and I suspect that, as in most of the countries I have visited it was probably first invented to protect the modesty of the female members of society — most likely by missionaries. Whatever the reason, I found my little girls were wearing them – and why not? Add a pair of bloomers and off we go. 'Ebony' with a skipping rope. 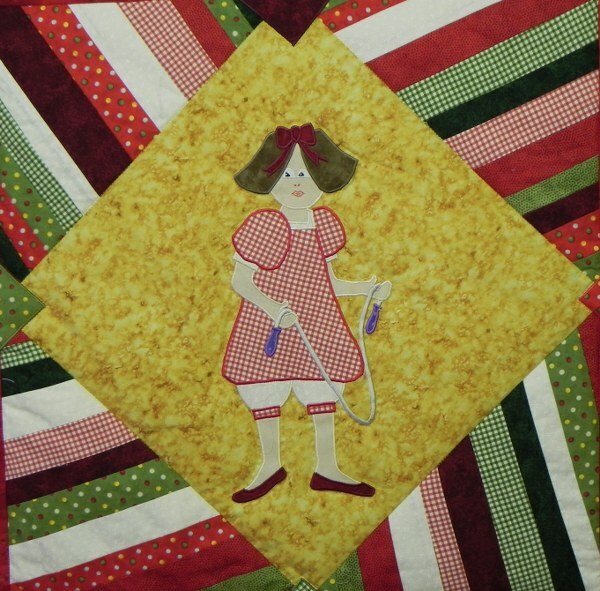 The skipping rope was made by fusing a piece of fabric cut using a piece traced from the pattern. 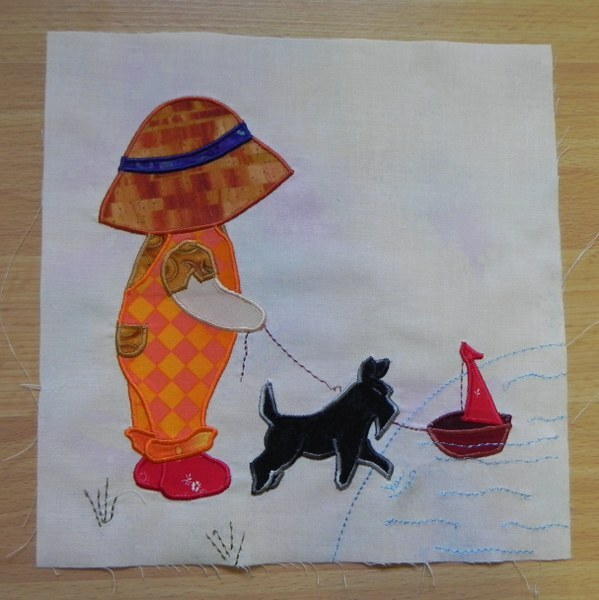 I then used a wide satin stitch to go over the whole ‘rope’. I think it is quite effective. It certainly worked better than a couple of other solutions I tried. I linked the blocks together by using different coloured gingham for the dresses and then changed their characters by varying the hairstyles. 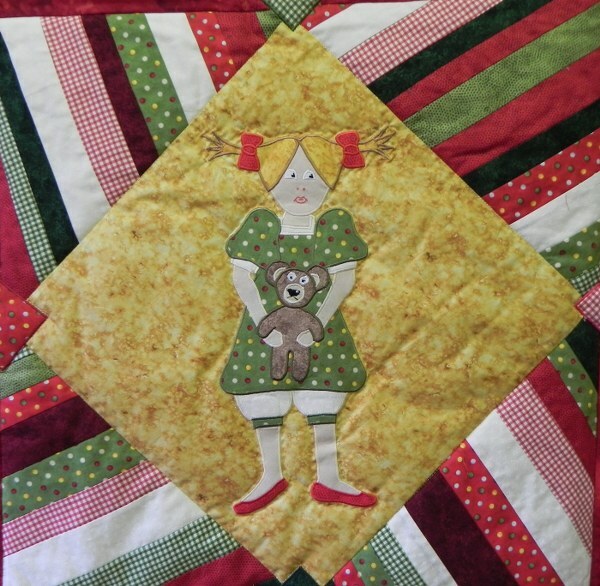 On some of the prototypes I did for this quilt I used curly wool and real ribbons for the hair and bows. I like experimenting with that sort of variation but they are only really suitable for a wall hanging hung out of reach of small fingers and I like my quilts to be touched and loved and therefore easily washed so all the accessories are firmly stitched down. I decided to do the blocks ‘on point’ so I needed something to make them square again – if that makes sense. I hit upon using the same fabrics as in the dress, bloomers, shoes etc and doing some crazy patch. 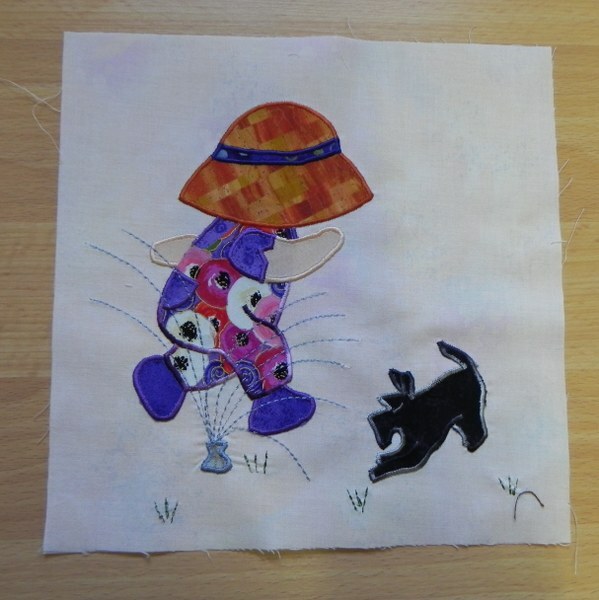 I love crazy patch, it uses up all the odd bits of fabric and always ends up looking good. Every example is different too as new fabrics and combinations are used. Add a few metres of sashing and a border and ‘Bob’s your Uncle’. Would that I could stop there but, no, I had to make another. I reasoned that sometimes people cannot see what is before them. 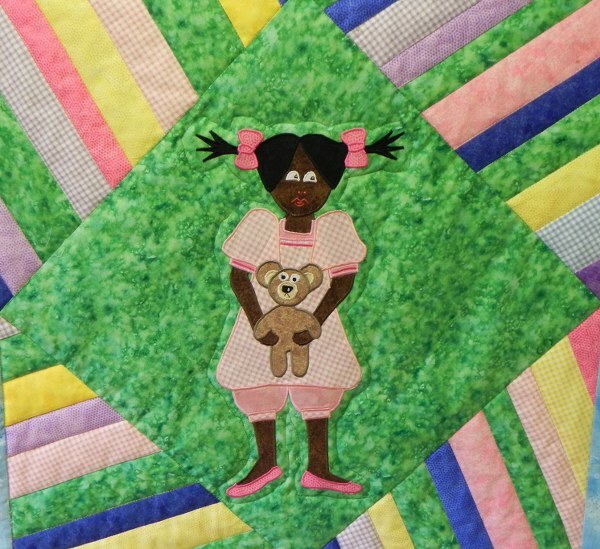 If I presented a quilt with little dark skinned children and they wanted one with light skinned ones then they may not make the connection. 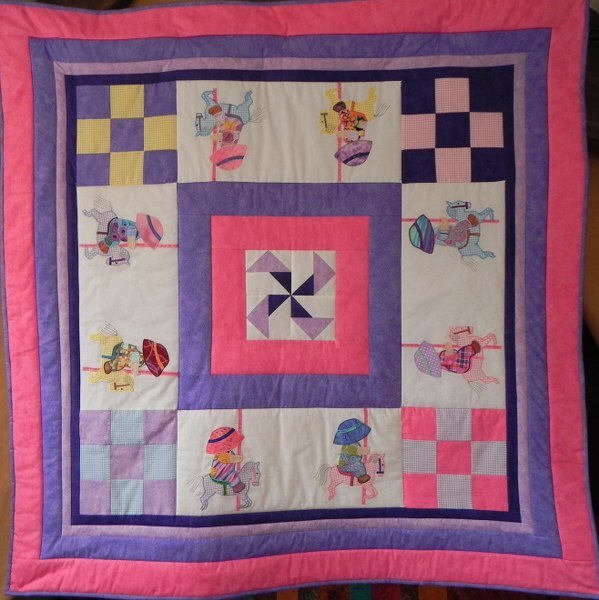 I therefore made another quilt, this time with pink fabric for the skin colour. That is why the quilt pattern is called ‘Ebony and Ivory’ – simples. Just in case you are still paying attention and haven’t fallen asleep, bear with me whilst I present ‘Ivory’. You will see that I have also changed the colour scheme. I know I have often bought a pattern as it has caught my eye mostly because the colours are mine and I would hate anybody to miss it because they couldn’t see past the colours. 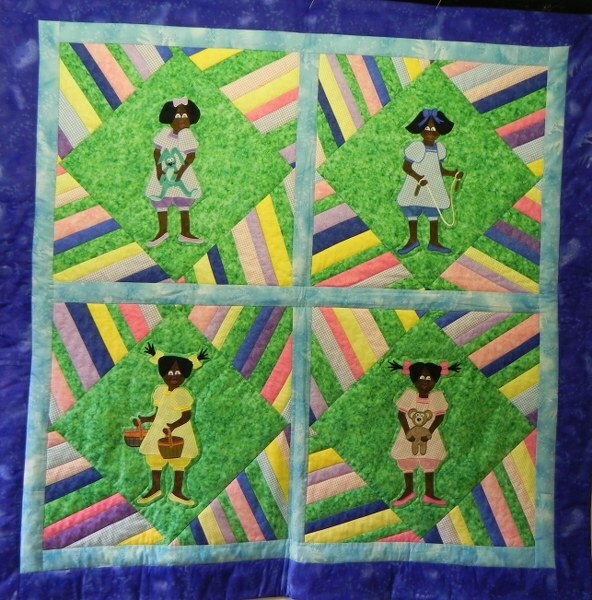 Of course I finally had my ‘lightbulb’ moment and realised that If I did both dark and light skinned children on the same quilt then I only need make one quilt for the pattern photograph. Not only would this be a lot less work but also I wouldn’t have to squeeze two photographs onto the pattern cover. I am sometimes amazed at my own genius. As you will see in a later blog, I did, indeed use this brilliant idea in another pattern. I did, in fact use it in two patterns which, if you are paying attention you will realise means I have saved myself a lot of work although this does not mean I saved time. What it does mean is that I can squeeze in another project I wouldn’t otherwise have done. If you would like to make one of these yourself the pattern is available on my website www.nsaaquilting.co.uk – or link to the right. 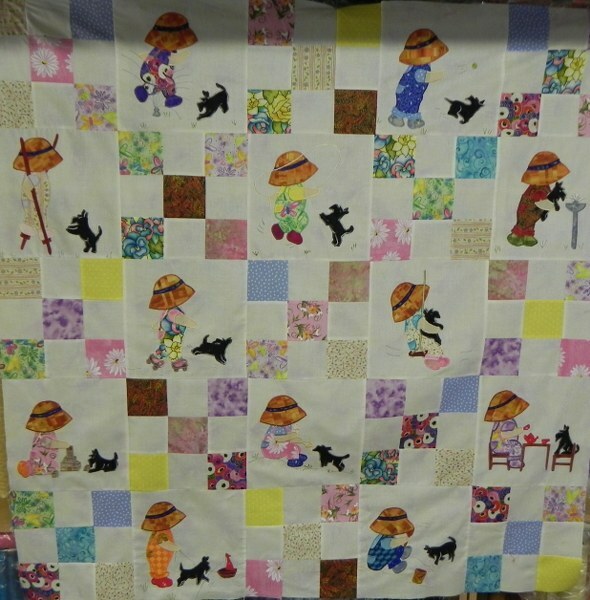 I posted a link to my last blog on Sunbonnet Sue on Quiltingboard.com. I was amazed at the response. Thousands, and I mean thousands of people came across to look. As you may have gathered from my very first Sunbonnet blog I was not overkeen on the Sunbonnet genre. I did it because it was quick to do and quite restful and I could add a few extras in the way of accessories. Finding so many people interested in the two blogs I have become more interested myself. 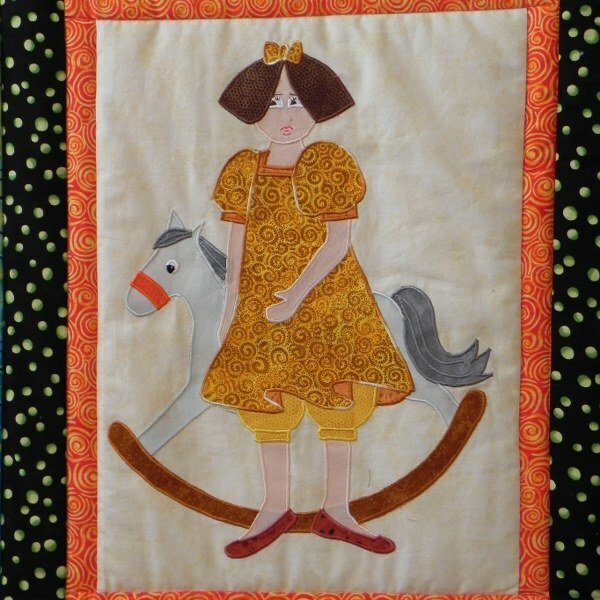 As a result I have done another quilt, this time featuring ‘Sue’ as a boy. I am again assisted by the patterns by Suzanne Zaruba Cirillo from ‘Sunbonnet Sue and Scottie Too’ which is available from Amazon in USA and UK, although I suspect stocks must be getting low as we speak. I have been asked for the name of the book by more people than Amazon reckons to have books in stock. Perhaps now is the time to buy from your friendly independent local or online retailer.I wish I had a few copies on my site. In the last quilt from the book I used one of the suggested quilt arrangements but chose the blocks I thought went together best. In this one I have followed the ones chosen to go together in the book as they combine perfectly. They depict ‘Sue’ camping with a spell in a hammock, cooking sausages over a fire, climbing a tree and going for a brisk walk assisted by a stout stick cut from a hazel hedge no doubt. In all activities he is accompanied by his faithful Scottie. When I was buying the book I got talking to another customer. 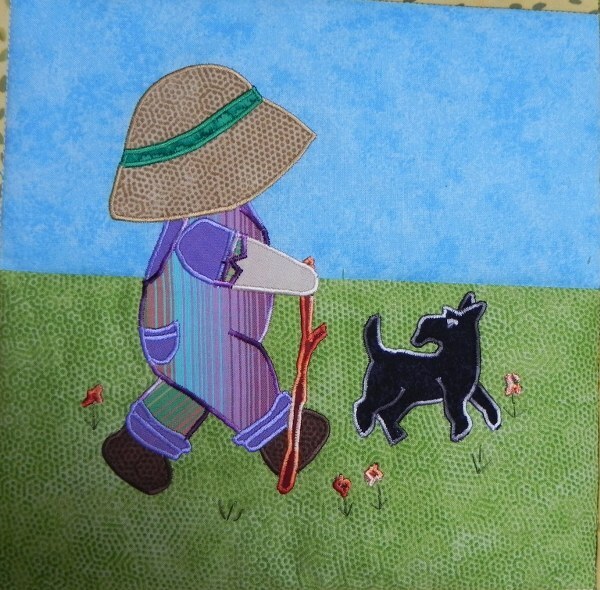 She had made one of the redwork versions for her grandson but, not liking the dog she left him out. 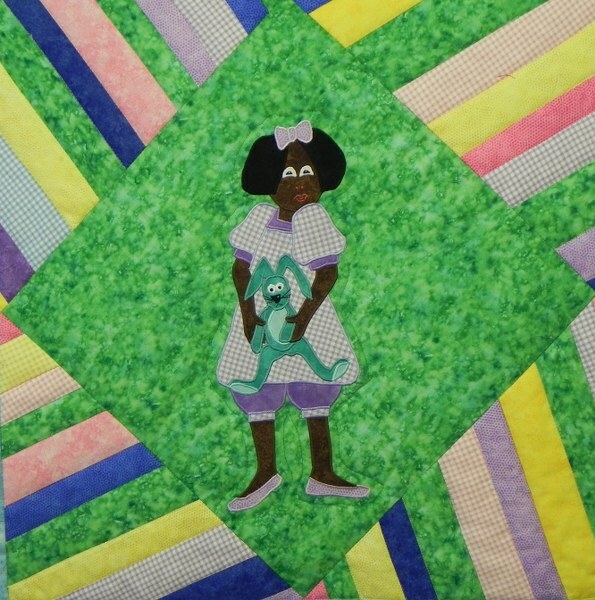 Unfortunately, rather than marvelling at the wonderful quilt his grandma had made him , he just wanted to know where his ‘doggy’ was. It just shows you – though I’m blowed if I know what it shows you. I thnk the secret of the enjoyment of making this quilt might be that every block is different and therefore keeps the interest. I am also lucky in that I have a very large collection of embroidery threads so that I can match colours quite well. You would be surprised how many times there still isn’t an exact match but that’s when the ‘contrast’ system kicks in. 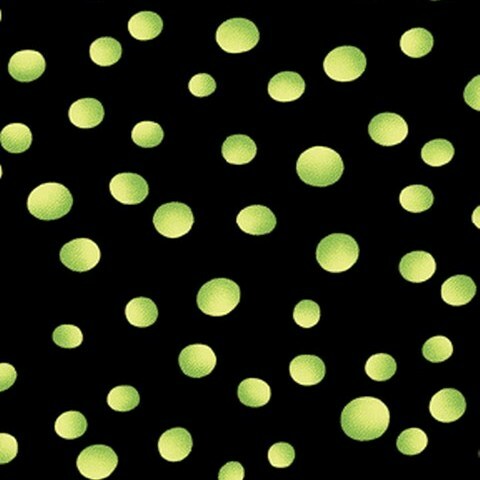 If you can’t match it, contrast it so that it looks as if you intended to do that all along. It quite often ends up as a better effect than a total match would have been. I am not usually a ‘country colours’ sort of girl. I am more the bright, breezy and a bit ‘in your face’ but this one calls for country colours so country colours I attempted. As it is an outdoor theme I thought a grass/sky combination for the background would also work well. 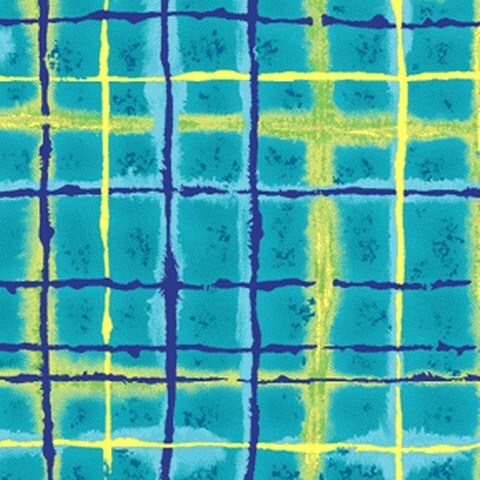 Other than that I tried to keep broadly to the sort of fabrics shown in the original. I am here to tell you dear reader that I failed. I cannot do country colours. I tried but somehow I couldn’t keep the bright colours out. My stash rebelled and pointed me away from the greens and browns to the mauves and oranges. This will not of course necessarily happen to you if you decide to make it. I believe that the stash will out so if your taste runs to country colours – then country colours you will get. If your stash runs to pinks and purples perhaps your Sue will be finding his feminine side. 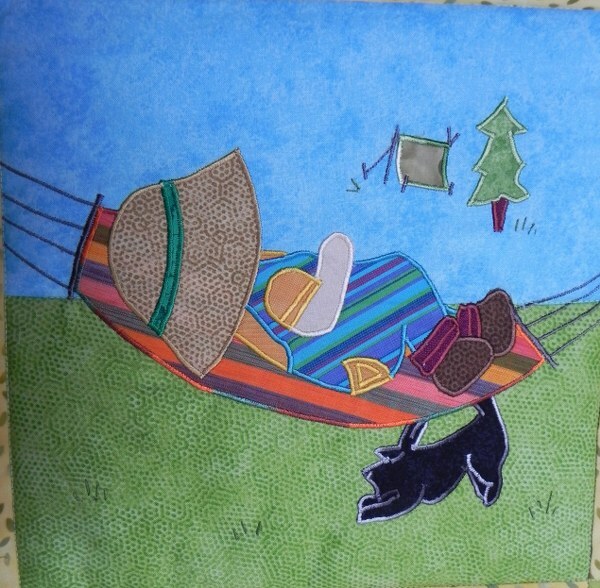 Either way your wall hanging or comfort blanket will be a lovely one-off. Hope you enjoyed this walk through the woods. 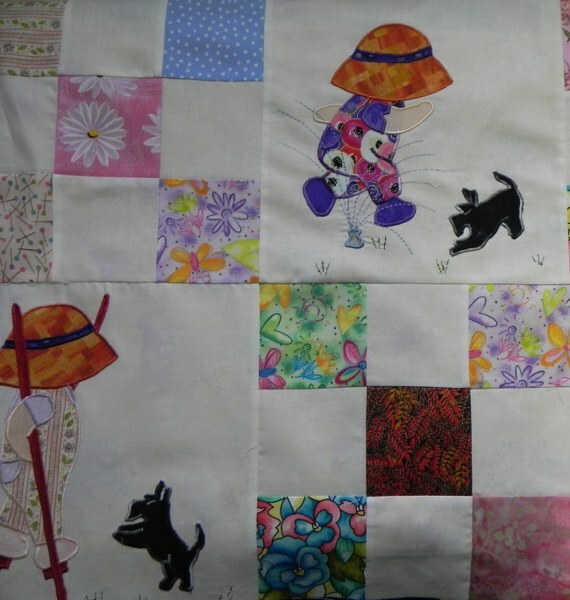 I am now off to carry on with the third quilt. Ithink I may be a convert to Subonnet Sue. 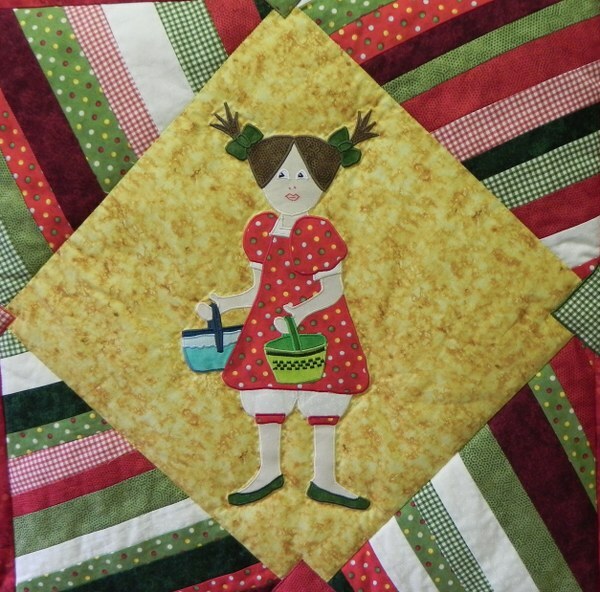 Last time I mentioned Sunbonnet Sue I was overwhelmed by the number of people who came across to look. 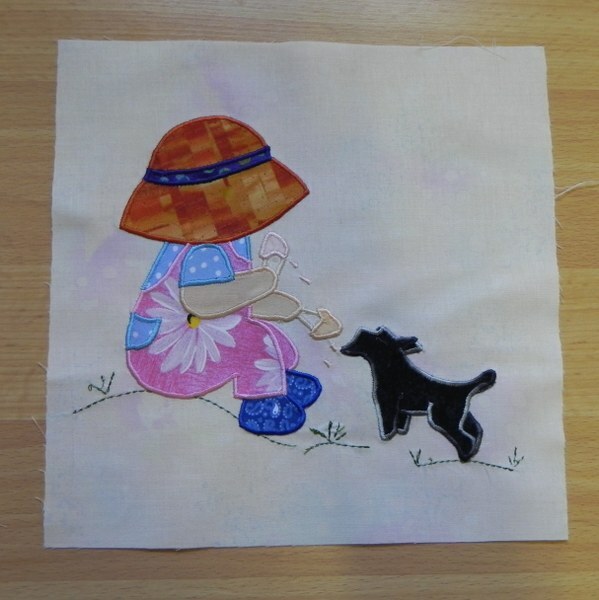 Realising how many people were interested in the little lady I decided to make another quilt featuring her. 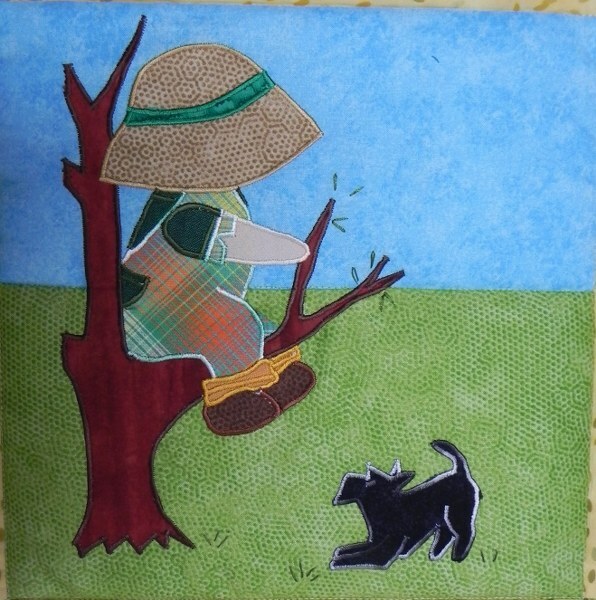 Years ago I bought a book featuring Sunbonnet Sue and Scottie both in redwork and applique. The book was written by Suzanne Zaruba Cirillo. The redwork examples are lovely but life is too short for me to go down that path. 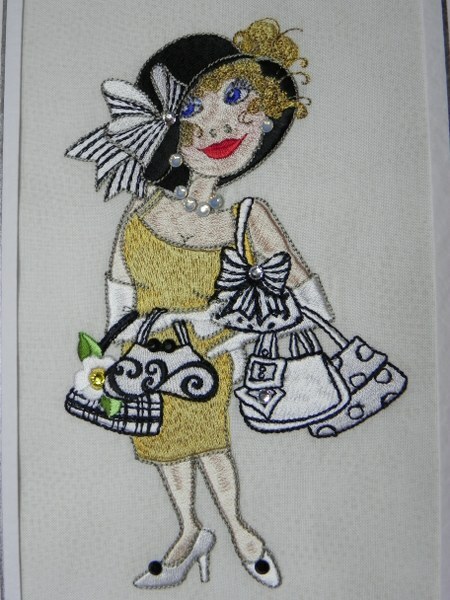 I did the applique. I took a few photographs as I was making it and will share them with you. 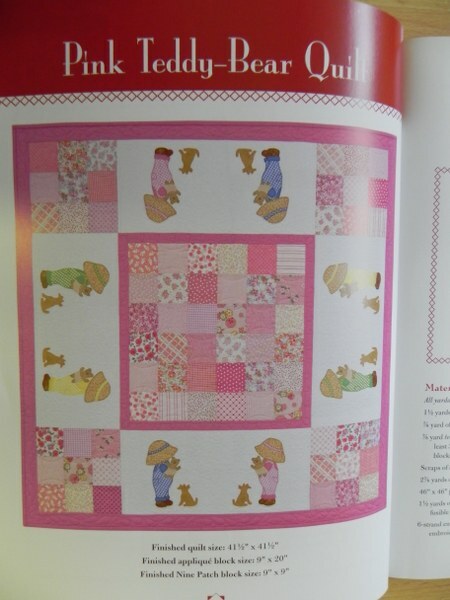 Although she is wearing dungarees, the whole point of this collection is that it features Sunbonnet Sue not Overall Sam and so I chose fabrics that reflect this. 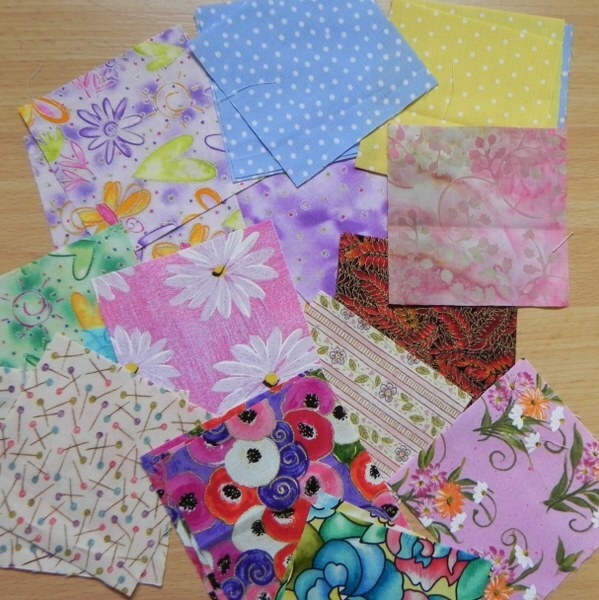 I usually use up my box of small pieces for applique but I decided that I would start on a new pile of fat quarters and stash pieces this time. This turned out to be a good idea as it meant I had fabric left over for the 3.5″ squares that make up the quilt. Behold the fabrics cut ready to piece. 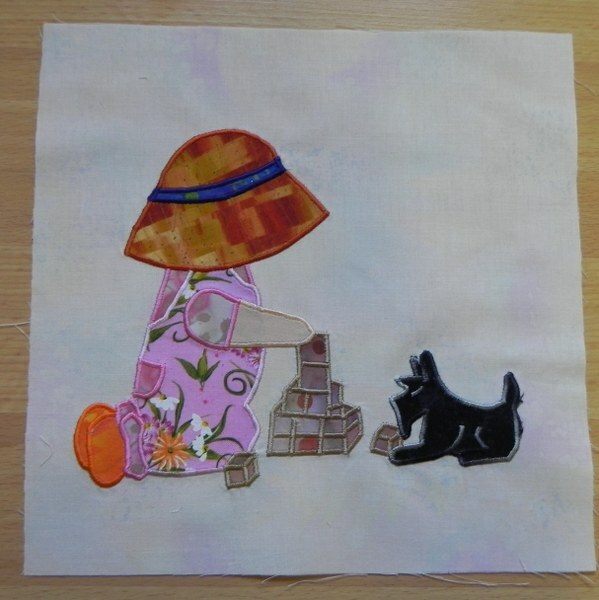 There were 12 applique panels and I used these and a few other fabrics to make the appliques. The panels start at 11.5″ and then are trimmed to 9.5″ after appliqueing. 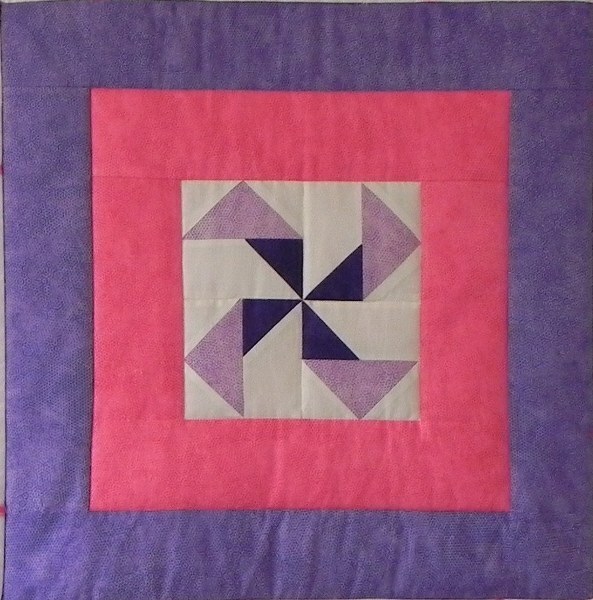 This is because the fabric usually distorts in the applique process and this way you end up with a nice square block. I particularly like the fabric used on these dungarees. A bit of boating on the lake calls for an orange outfit. I love the way the dog is so expressive . In each picture you can see what he is supposed to be doing. I am sure you have all seen a dog in this pose when a ball is thrown for it. If I Bring it Back You'll Only Throw it Again. After a bit of a run round the park a drink is called for and a handy drinking fountain fits the bill. Obviously this is on a different day as the outfit now is in shades of Autumn. Very fetching. Next day we might go for a spot of roller skating in the same park. That is if the warden doesn’t catch us. Nothing like a skipping rope to drive a dog to distraction. There’s nothing like a shower on a hot day. Having soaked the ground the way to keep your dungarees out of the mud is to wear stilts. Another day might see us on the beach, digging for treasure. On the way home a turn on the swings. At home for a few minutes with the blocks. How many More Can I get On Here? Finally a refreshing pot of tea for two – bliss. 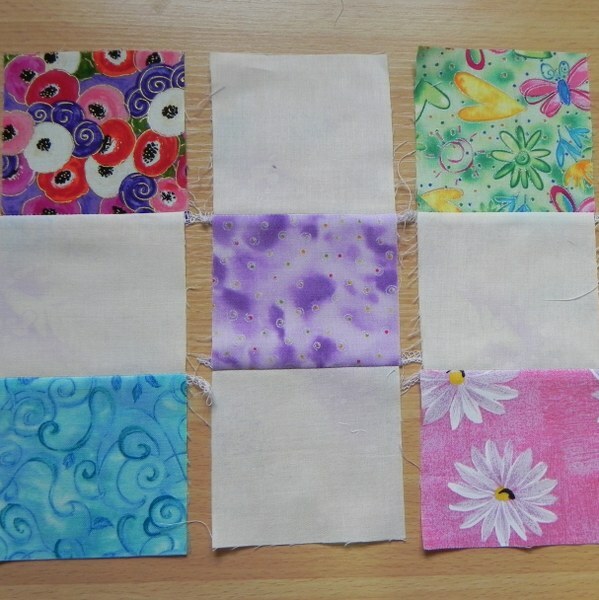 Having finished the 12 blocks the rest of the fabric is cut into 3.5″ squares of prints and white and arranged as below. 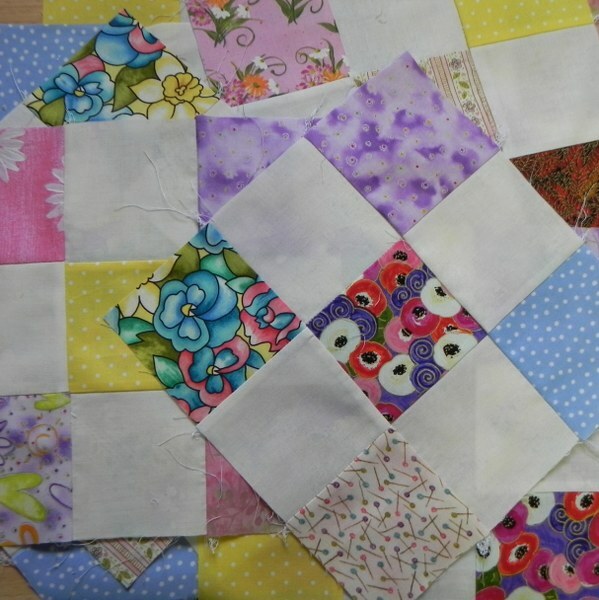 The panels are then alternated with the 9 patch blocks and stitched together. Then the quilt centre is complete. Add a border and we’re ready for quilting. I have now finished the quilt and bound it so here is a photo of it complete. One with the backing showing. This for a girl but you could do a boy’s one with Overall Sam in more masculine colours.